The 1949 St Pats Old Boys senior side was the second team in Marist St Pats to win a Jubilee Cup (some members pictured right). 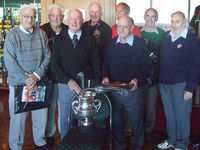 The Marist club first won the trophy in 1948 and St Pat’s shared it with Petone a year later. Marist went on to win it again in 1950. Marist and SPOB later merged in 1971. Something of the intensity of club rugby in those days was captured in the poem by a St Pats Town old boy, Jack Kelleher, later editor of the Dominion. He penned it after St Pats Old Boys beat Petone 20-5 at the Petone Rec on July 31, 1950, one week after Marist had also beaten them, 22-12 at Athletic Park. ‘Your Holiness, this is now over to you. But what of our own who will have to stand down? Oh! They’ll get a job pulling blinds up round town. With St Patrick’s College, Kilbirnie in the limelight earlier this year, celebrating 125 years, former student Peter Jack (1961−1964) has been looking at its pedigree on the rugby field. The first All Black to come out of St Patricks, Wellington, was Eric Harper, 1889−1892. He played for Canterbury initially and was a New Zealand rep, 1904−1906. He was one of the college’s first World War I victims. Richard McKenzie and Tom Lynch followed in 1913−1914 and toured North America together. The fourth All Black was the first to take Holy Orders. Paul Kane, who was selected after his ordination, played as Paul Markham in 1921. Two of the three famous Brownlees of Hawke’s Bay are former St Pat’s boys. Laurence played for the All Blacks in 1921 and Maurice, 1922 – 1929. The best known of the Brownlees, Cyril, went to Sacred Heart College in Auckland. Another Hawke’s Bay representative and St Pat’s boy, John Blake, wore the jersey from 1925−1926. Another player who became a priest from the college, Patrick McCarthy, played half-back for New Zealand for one match in 1923. The Bush Union’s only All Black, St Pat’s old boy Athol Mahoney, played for New Zealand from 1929 to 1936. ‘Tonk’ also played for the second NZEF side in Egypt during the Second World War. After a 23-year gap, Brian Findlay, only a lower grade player at college rugby and a Manawatu representative, became All Black cap 596 in 1959. Marty Berry, also known as the ‘18-second All Black’ having been on the field for just 18 seconds when he played his only test against Australia in 1986, played 11 games from 1986. Both Brian and Marty attended the college only briefly and Marty was the first All Black from the Kilbirnie site. The second and perhaps the best known in recent times is Jerry Collins, who played for the All Blacks from 2001 and who is still playing in Europe. Two former students of the 1880s and 1890s returned with the 1904 British team to play against the All Blacks. They were Drs Arthur O’Brien who was team manager and Patrick McEvedy. Both worked at London’s Guys Hospital and later returned to settle in New Zealand. Dr O’Brien practised in Christchurch and Dr McEvedy in Wellington. McEvedy also returned in 1908 as vice-captain of an Anglo-Welsh side. On settling in Wellington he influenced New Zealand rugby as president of the NZ Rugby Union for a time. Winston McCarthy 1923−1925 is another famous old boy of the college. He represented the first college teams at cricket, soccer and rugby at half back and played for Bush from 1930. In 1937 he began his career in the New Zealand Broadcasting Service and became the ‘voice of rugby during the 1945-1946 tour of the UK with his catch phrase ‘wait for it, it’s a goal’. By the time he retired in 1959 he had broadcast 38 tests. Long time Wellington rugby rep Ernie Todd who trialled for the All Blacks in 1939 is also from St Pat’s. He was on the WRFU and NZRFU executive and managed the All Blacks in the 1972−1973 tour to Britain and France. Noel Mullin, Des Chambers (RIP), and Bernie Lynch.